Well, we’re at the end of another retrochallenge. I knew that time would be limited for me this time, but I still managed to have a little bit of fun. Unfortunately, there was a severe lack of blogging updates, and I missed my target. But it’s all about having fun, right? What was I able to accomplish? I was able to boot up an old VAX machine from my collection. CANADA:: was using a license from the VMS Hobbyist program that had expired several years ago. Trying to track down the current hobbyist registration page was difficult, and a big roadblock was thrown up by requiring a DECUS membership number – the drop-down list of DECUS chapters no longer includes the defunct DECUS Canada so my membership number wasn’t accepted by the form. I was forced to use a little utility called PAKGEN which is able to generate VMS license keys on demand. I’m not advocating piracy, and I will continue to try to get my hobbyist license renewed. What about the radio part of the project? I was able to get CANADA:: to talk to my DECnet network at home over a rather short radio link. During this testing, I was able to confirm that the Icom ID-1 radios truly are an ethernet bridge, and they will pass any ethernet traffic sent to them – even protocols as weird as DECnet, which accomplishes layer 3 addressing by altering the layer 2 MAC address. I also confirmed that DECnet performance is terrible over unreliable links! DECnet (probably rightly) assumes that an Ethernet link is reliable, and any dropped packets take the performance down to a crawl while it tries to recover. The ID1 bridge delivers a 128Kbps half duplex ethernet bridge. There is no error detection/correction in this bridge. The ID1 assumes that there’s a higher layer that will take care of this – which is perfectly acceptable for TCP. 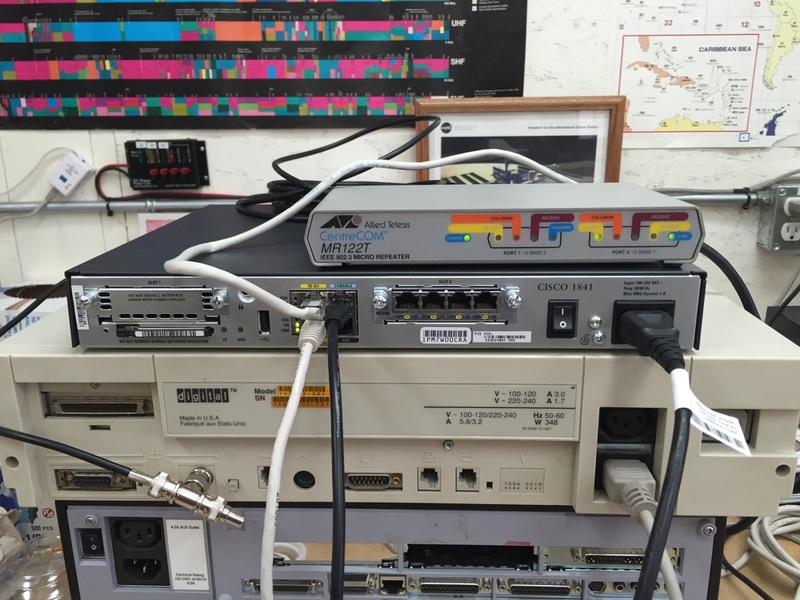 I also spent some quality time with antique Cisco routers. I happily discovered that the Cisco 1841 has a build of IOS that supports DECnet. 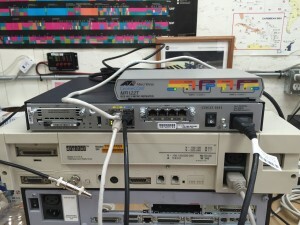 The intent of my challenge was to host this router at the local VA7DIG D-Star repeater site and have it route any DECnet traffic it heard over the air into the HECnet network. This is where I ran out of time, and haven’t got finished yet. I still intend to get this going, so I’ll provide more updates. Of course there were lots of shiny bikes along the way. I got distracted by a couple of other projects. A nice little VFD display showed up from eBay, so of course I had to play with it. Also, while digging around my office, I came across some old external hard drives. On one of them, I discovered an old Compukit UK101 emulator I wrote for windows 15 years ago! I thought I should dust off some old brain cells, and so I’ve decided to take a stab at learning Swift and porting the emulator over to OSX. This is a major work-in-progress, but hopefully there’s a useful skill at the end of it. In summary, some success, but a lot of fail. We had a bumper crop of Retrochallenge entries this time around. I look forward to seeing the winners! This entry was posted in Retro Challenge by ian. Bookmark the permalink.